When I think back to special occasions like birthdays and Christmas during my childhood, this delicacy is always present. 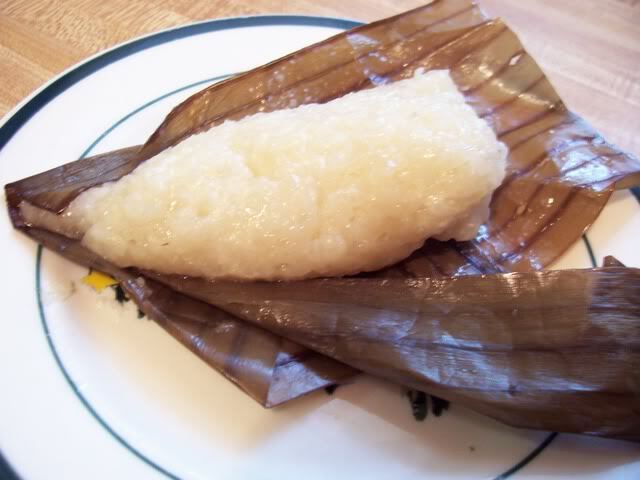 I had a grandmother who made the best suman and she would always make some everytime we saw her. 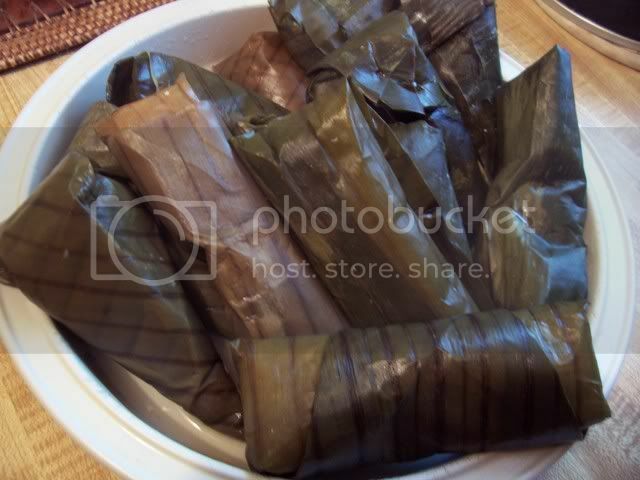 The whole family claims, to this day, that no one made suman quite the way she did and I agree. While my girls like my version enough, to me it just falls flat compared to the memory of the suman’s my lola (grandma) used to make. This is actually a very easy rice cake to make, most of the flavor comes from the banana leaf wrapping. Here is a photo of my lola with the recipe following. My recipe that doesn’t come close to hers but is good enough to keep her memory alive. Yeah, the baby with the big head is me. 😀 I didn’t really know her for too long, she died soon after we left the Philippines to live in the U.S. and we didn’t ever really had a chance to say goodbye, but maybe that is for the best for all I have of her is the memories of her love for us and her love of food. If she were alive today, she would be a foodie. The proportions I’m listing below is for a small batch, enough to make about twenty packets of suman. Just increase the ingredients proportionately if you’d like to make a larger batch. 2 cups Coconut Milk & water – I used a 14 oz. can of coconut milk and added enough water to make 2 cups. Place all the ingredients in a pot and bring to a boil. After it comes to a boil, stir and immediately lower the heat to the lowest setting and cover. Let is simmer on low for 20 minutes then turn the heat off. Don’t open the pot, leave it for another 15 to 30 minutes to finish cooking. Alternatively, you can also put everything in a rice cooker and let it cook on its own. When the rice is cooked, let it cool a bit before wrapping. I don’t have a stand of bananas in my backyard, so I get mine frozen from the store. You can find frozen banana leaves in most Asian and Latin markets. Luckily, quite a number of these ethnic grocery stores have opened up in my neighborhood and it’s not such a pain to get banana leaves anymore. 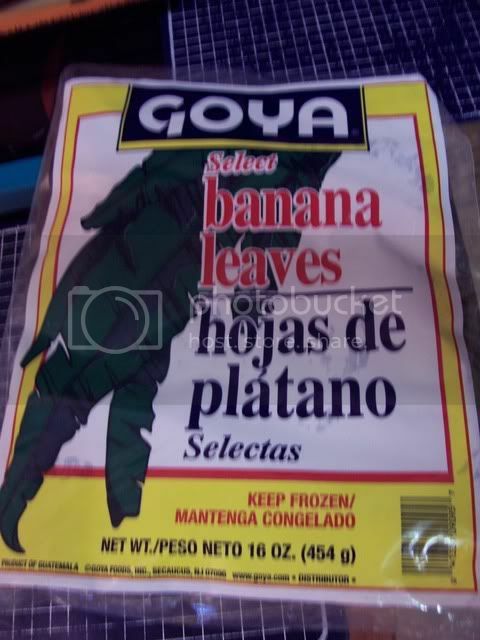 To prepare your banana leaves for use, defrost them first. Then, to make them more pliable, take sections of the leaf and hold it over a heat source like the eye of your stove until the color gets bright. Set it aside and wipe down before using. The English Patis has photos of how to prepare your banana leaves and how to wrap suman if you’re interested. She made another version of suman, with lye water, that I am going to try out next. I didn’t get a chance to photograph the wrapping process but it’s pretty intuitive. My grandmother wrapped her suman in a cone shape but you can also wrap them in tubes or packets. You can see we experimented in wrapping them up both ways. Below are the cone shaped ones, the flaps held in place by toothpicks. After you get them wrapped, place them in a pot large enough so that you can cook them with enough water to almost cover the tops. You can steam them too, but I remember my grandma doing it this way except she used an earthen pot. Let the water come up to a boil and lower the heat so it just simmers gently. 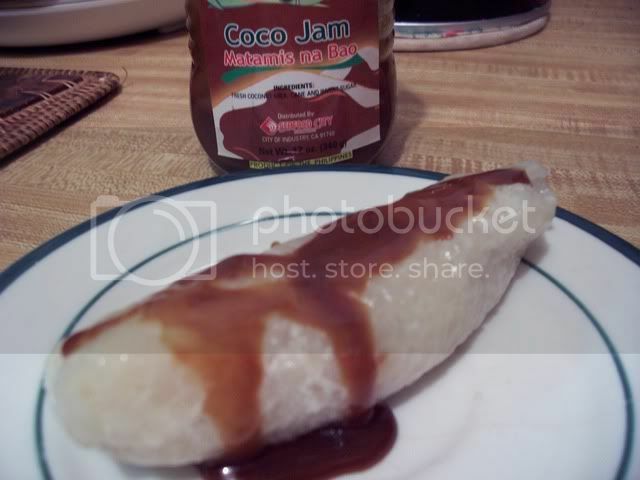 Cook for 20-30 minutes then remove the suman from the water. Let it cool before digging in. Here are the ones wrapped into rectangular packets after they came out. Notice how the banana leaves have wilted down. Since the suman does not have any sweeteners cooked into it, it is generally served with something sweet on the side. I prefer to have mine with just a sprinkling of sugar on top, but suman is also typically served with latik, made by cooking down coconut cream. My shortcut way is to serve it with bottled coconut jam, a caramel like sauce made from coconut milk. My daughter Asi recently made suman to share with her friends at school. She made the whole thing by herself from cooking the rice to wrapping it. She said it was a hit with her friends and they were amazed with the banana leaves. Hi! Can I use steamer instead putting iit in the water?thank you! I made this as an apprentice, looking for approval from a Filipina friend of mine who’s made it all her life. For the second cooking, she added more coconut milk with some water just enough to cover the top. It was amazing! I love suman. This is one of the desserts we usually prepare during fiestas and other special occasions in the Philippines. We serve this dessert to our visitors as a form of our Filipino hospitality. Many thanks for sharing. Hi Albert, yes, it would mean cooking the suman twice. I recommend that on the first cooking, don’t put too much water to make it mushy and just cook it until it is barely done. Some people only cook it halfway because of the second cooking. 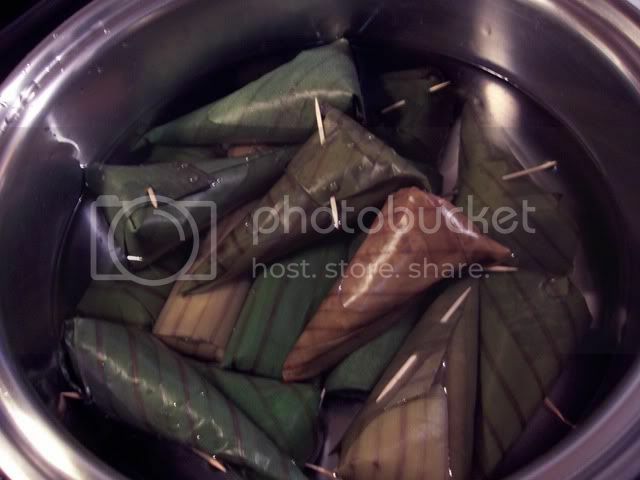 The second cooking, while wrapped in banana leaves, will not dilute the flavor but will actually add on the scent of the banana leaves which is what gives suman its distinct aroma and flavor. Jmom!!! You have me drooling over here!!! I haven’t had suman for years. But at least lucky me, I did see banana leaves in the freezer section of a nearby Asian supermarket, I am going to give your recipe a try. Thanks for sharing. thanks so much for this recipe. my husband has been begging me to make some. 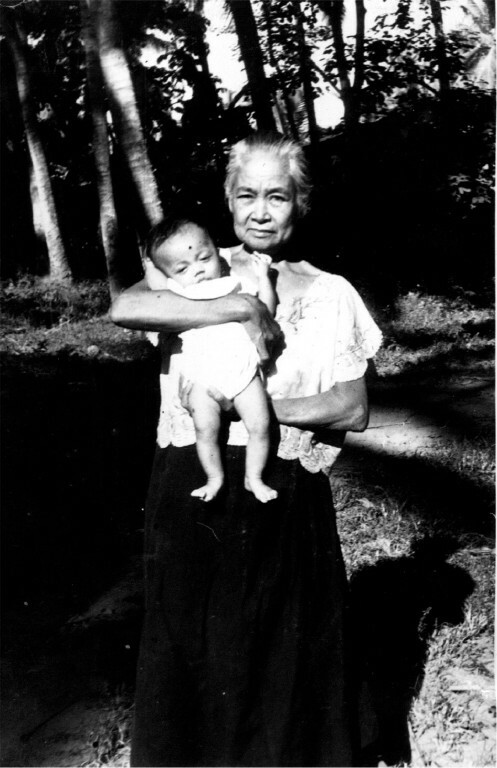 ilove the picture of your grandma,she reminds me of mine. love it with the brown sweet sauce! 😀 others say its yummy when you fry it a bit in butter before serving, although i havent tried it. they have flavored suman nowadays.. yummm!! so, is this a sweet dessert rather than a savory one? Call it weird, but I grew up not liking suman much..I do eat but rarely hehe..makes me wonder if the ones I tasted are not the best 😀 or just my tongue is weird…but this is becoming a favorite dessert served in restos ano? true with cocojam, yan ang fave ko! Happy weekend!